gamophyllous A botanical term identifying a plant with connate leaves, petals, etc. gamosepalous With the sepals connate, at least toward the base. gap grading A measurement of particle sizes in earthen material where intermediate-size particles are completely lacking. See also continuous grading. garage A building, or a portion thereof, used or designed to be used for the parking and storage of vehicles. garden 1. An ornamental outdoor landscape. This type of garden is almost always near a building or in a city and is highly maintained. It may be a formal garden or informal. 2. A landscape near a building or, indeed, any land space that is enjoyed. It is a place used in leisure enjoyment and/or to enjoy viewing. It is pleasant to the eyes and gladdens the heart. "God Almighty first planted a garden; and indeed it is the purest of human pleasures; it is the greatest refreshment to the spirits of man; without which buildings and palaces are but gross hand-works. . ." (Francis Bacon, Of Gardens, 1625 A.D.) 3. A piece of ground for growing edible plants, especially vegetables, but also fruits, or any plant with edible parts. It is usually of a small size and capable of supplying some food for a single family or a neighborhood. garden apartment An apartment building located on a lot, either singly or together with other similar apartment buildings, generally having a lower density of population than other apartment complexes and having substantial landscaped or natural open space adjacent to the dwelling units. garden hoe A tool with a long handle and a small metal plate at its end at nearly a right angle to it that is useful in weeding, making furrows, etc. 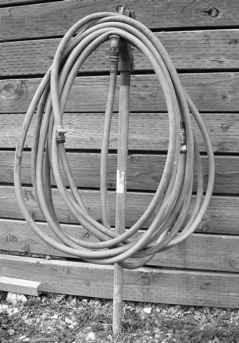 garden hose The common hose used for attachment to a hose bib, or water spigot, for distribution of water, usually in % or % in. gardening trowel A small, short shovel, usually less than 14 in long with handle included, for small plant placement, digging in seeds, etc. garden rake A long-handled tool with a 12 to 18 in head of tines useful in raking up rocks, clods, debris, etc. gargoyle A water spout or drainage opening projecting from a roof, or the parapet of a wall or tower, or a fountain opening on a wall, with the essential element being a human, an animal, etc. carved into a rather odd figure.